Nextbigfuture described a future where China helps build out the infrastructure that the rest of the developing world needs over the next few decades. The shortfall of infrastructure is lowering the potential GDP growth by 2-3% in many countries. An extra 2% GDP growth globally would accelerate the arrival of a world with a quadrillion dollar economy measured in todays dollars. Good policies and accelerating the adoption of key technology can bring forward a better world economy by decades. The World economy is currently about $106 trillion in GDP purchasing power parity (PPP). This is about $15000 per person in PPP dollars. China is leveraging its $4 trillion in reserves to provide low interest financing for high speed rail, export of Chinese nuclear reactors, factories and property development. Education, energy, urbanization and innovation are the main keys. Google could provide high speed global internet over the next few years with long endurance stratospheric balloons. This could boost the world economy by 22 trillion by 2030. Robert Fogel, nobel prize winning economist has projected China to have 123 trillion GDP in 2040 China’s share of global GDP — 40 percent — will dwarf that of the United States (14 percent) and the European Union (5 percent) 30 years from now. So World economy Nobel Prize winning economist Robert Fogel is projecting a world economy of $307 trillion in 2040. This prediction is that the world economy will triple in 25 years. A further tripling afterwards would have a world economy of $900 trillion around 2065. The average per capita wealth would be $100,000 on a PPP basis for each of about 10 billion people. This would be an economy ten times bigger than today. IMF data indicates that on a purchasing power parity basis the world economy became a $100 trillion economy in about 2013. The same data series indicates that the world economy was about 10.95 trillion in todays PPP dollars in 1980. This would mean that the world had a ten trillion economy in about 1975. The Maddison world GDP estimates would put the ten trillion world economy in todays PPP dollars at about 1965. The Maddison world GDP estimates would put the one trillion world economy at about 1850. World population in 1850 was about 1.26 billion. World population in 2070 would be about 10 billion. It could be 11 billion based on Africa birthrate sustaining at a higher rate longer than previously expected. For the global average person to be ten times poorer would be about 1913 when per capita income was about $1500. The global average wealth holds steady at about $400 to 500 per person for a few thousand years. A global per capita income of about $40,000 per person in today PPP dollars would be about 2040-2050. Getting to $150,000 per person in todays PPP dollars. Kindergarten was invented in about 1870. In 1900 only 7% of children in the United States were enrolled in it. Between 1900 and 1919, half of the student population [did not] achieve eighth grade status. At the beginning of the 20th century, fewer than 1,000 colleges with 160,000 students existed in the United States. explosive growth in the number of colleges occurred In bursts, especially 1900-1930, in 1950-1970. Continuing progress in agriculture will allow everyone to be fed with nutritious foods at the western level of consumption. This is described below after a discussiojn of energy. Wealth and economic growth are strongly connected to low cost energy. Recent research shows that energy has a ten times larger effect on the economy than previously believed. Beyond 2030, it will be possible for radical changes in the energy mix to gather effect. As noted China will be strongly pushing nuclear power. Initially it will generation 3 and 3.5 reactors. But in 20 years there will be stronger shift to factory mass produced generation 4 reactors. Reactors like more advanced versions of molten salt reactors. There is the Thorcon molten salt reactor design and Terrestrial Energy’s molten salt reactor. china is also researching molten salt nuclear reactors. Canadian company Terrestrial Energy is to collaborate with the USA’s Oak Ridge National Laboratory (ORNL) to develop its molten salt reactor to the engineering blueprint stage. Molten salt reactors (MSRs) use fuel dissolved in a molten fluoride or chloride salt. As an MSR fuel salt is a liquid, it functions as both the fuel (producing the heat) and the coolant (transporting the heat away and ultimately to the power plant). This means that such a reactor could not suffer from a loss of coolant leading to a meltdown. The basic technology is not new – it was first demonstrated at ORNL in the 1960s, where a 7.4 Wt test reactor, the Molten Salt Reactor Experiment (MSRE), operated from 1965 to 1969. Terrestrial’s Integral Molten Salt Reactor (IMSR) builds on that early work and also on ORNL’s later Denatured Molten Salt Reactor (DMSR) design. Indeed, several former ORNL scientists sit on Terrestrial Energy’s advisory board, and Terrestrial Energy CEO Simon Irish explained to World Nuclear News that it makes “absolute sense” to work with ORNL which already has the expertise and experience with the design from which IMSR evolved. The collaboration with ORNL is expected to enable the IMSR to complete the conceptual design stage – where all design parameters are fully specified to start preparing engineering blueprints – in late 2016. Terrestrial Energy’s standout feature over other MSR projects active today, Irish said, is that it already has a reactor design specified to a recognised industrial level, putting the company in a strong market position. All of Terrestrial Energy’s decisions are to simplify and speed a commercial molten salt reactor to market. They will still have a reactor that will greatly lower the costs and have improved efficiency over todays pressure water and boiler water nuclear reactors. The small modular design integrates primary reactor components in a sealed and replaceable core vessel that has a projected life of seven years. The IMSR will operate at approximately 700°C, which can support many industrial process heat applications, and Terrestrial intends to offer models ranging from 80 to 600 MWt, which it says would be ideally suited for remote communities and industrial operations. Terrestrial Energy announces that it has entered into a Letter of Intent for services with Canadian Nuclear Laboratories, based in Ontario, Canada. This arrangement includes research and development work that is required to bring the company’s Integral Molten Salt Reactor (IMSR) to the engineering blueprint stage, expected in late 2016. Terrestrial Energy has the objective of beginning commercial deployment of its proprietary Molten Salt Reactor technology by early next decade. Molten Salt Reactor technology represents a revolution in nuclear safety, waste and proliferation resistance, and in energy cost-competitiveness. TEI’s Integral Molten Salt Reactor (IMSR) is a small modular design, with models ranging from 80 MWth to 600 MWth – ideally suited for remote communities and industrial operations, including on- and off-grid power provision. Canada provides a favorable jurisdiction for the company’s Molten Salt Reactor development, licensing and marketing. TEI’s board consists of executives from the nuclear, natural resources and finance sectors. 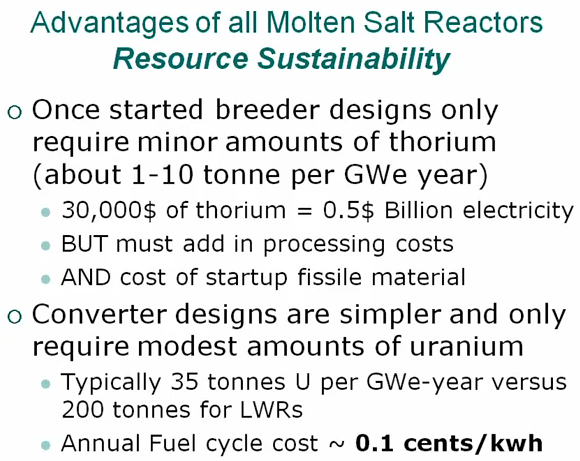 In previous design discussions about a similar Denatured Molten Salt Reactor , David LeBlanc believed that capital costs could be 25% to 50% less for a simple DMSR converter design than for modern LWRs (light water reactors). Later units that include electricity generation can still send steam for cogeneration (use steam for desalination or the oilsand production. This provides another revenue stream for the IMSR nuclear plants. Nextbigfuture thinks the IMSR can get down to 0.86 cents per Kwh. Regular agriculture is on track to boost yields to 15 tons per hectare for most of the grains. Yuan Longping, China’s leading agricultural scientist, realized one of his 80th birthday wishes recently when his super grain brought yields of 13.9 tons of rice a hectare, setting a new world record for rice output. The rice breed, DH2525 (Y two superior No 2), produced a harvest of 13.9 tons a hectare during its trial planting in Longhui county in Hunan province. Does the present breakthrough translate into a yield of 13.5 tons per hectare at commercial scale? Yuan did not think so, but 80% at more than 10.5 tons per hectare is realizable according to past experience. 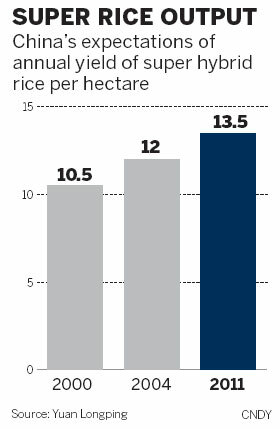 The highest rice yield in the world is in Australia, on average about 9.9 tons per hectare (660 kg/mu), followed by 6.7 tons per hectare (445 kg/mu) in Japan. The yields of China’s super-rice have now reached 550 and 600 kg/ mu, respectively, at large scale, as the result of the first two phases of development. So spreading best practices boost worldwide yield by 50%-100%. What is done across an entire country (Australia) to other countries. These plants were generated from regular plant breeding. They did not use genetic engineering. Plant breeding has existed for thousands of years. Assyrians did plant breeding before 870BC. Milk production was raised by 50% over the last decade and by 5 times over the last several decades. Innovations like washing cows increased milk production. Milk production is still expected to increase by 30% this decade. It takes about 8 pounds of grain to produce 1 pound of beef. World production of meat is about 260 million tons and beef production is about 55 million tons. Chicken and fish are about 1.5-2.5 pounds of grain to produce 1 pound of meat. Fishfarming and Greenhouses could be used to reduce the footprint for feeding humanity. Denser urbanization, fish farming and greenhouses would enable more areas to be converted into nature preserves. It is believed the first practical greenhouse was built by French botanist, Jules Charles, in 1599 in Leiden, Holland. Ancient greenhouses might have existed in Pompeii. Greenhouse management is well understood. A survey disclosed that construction costs to establish a complete economic unit [greenhouse], to include required equipment, varied from $5,500 by a Louisiana grower, to over $70,000 for a completely automated unit in Canada. Turn key construction costs by competent greenhouse construction contractors were substantially higher than construction costs by an owner/operator who supervised construction and used subcontractors. The average construction costs varied from $1.90 to over $30/ft2 ($20.90-$323/M2). These expenses did not include the cost of land. The average cost was $5 per square foot in the US or Canada. Penn state has a greenhouse design for Africa that is 5.5 meters by 6 meters (over 300 square feet) and is one-fourth the cost of other greenhouses in Kenya. The Penn State greenhouse costs approximately $600, compared to a standard greenhouse, which goes for about $2,300. “They can purchase it and pay it off within three growing seasons,” Eckard said. “It’s about empowering others. That’s why I’m involved.” With a greenhouse, a farmer can extend a growing season to three crop cycles and they can keep insects away from the crops. The Netherlands has 10,000 hectares of greenhouses that produced over $5 billion per year worth of agricultural production. Spain has over 50,000 hecatres of greenhouses in Almeria Inveranderos. Agricultural land constitutes only a part of any country’s territory, which in addition also includes areas not suitable for agriculture, such as forests, mountains, and inland water bodies. Agricultural land covers 33% of the world’s land area, with arable land representing less than one-third of agricultural land (9.3% of the world’s land area. Arable land (13,812,040 km²) – land under annual crops, such as cereals, cotton, other technical crops, potatoes, vegetables, and melons; also includes land left temporarily fallow. Permanent Crops (1,484,087 km²) – Orchards and vineyards (e.g., fruit plantations). About $65 million for greenhouses that cover a square kilometer for the average deployed systems. The lower cost Pennstate system would be about $20 million to cover a square kilometer. So let us say $65 trillion for 1 million square kilometers. This would be nearly double the agricultural yield. Over years it would be less than 2% of GDP. If volume production and economies of scale could lower the cost the more “advanced greenhouses” were scaled that can achieve 20-30 times the yield of regular land then either the yield could be increased or less land could be used. This is before considering vertical farming to apply skyscraper technology to boost the amount of land. Similar simple approaches can be used to boost water and energy levels. Also, efficiency to support people living in developed lifestyles can be easily doubled (living in luxury apartments in Manhattan, Hong Kong or Tokyo instead of in McMansions). Greenhouse Advanced Technology Expert System (GATES) was created to perfect vegetable and fruit greenhouse production in high-sun and low-humidity areas. Adjacent to our facilities in Marfa, Texas this revolutionary greenhouse is a combination of unique and valuable intellectual property. The entire project is a multi-million dollar investment developed using new concepts in greenhouse design technology, climate control, and crop management. Utilizing new combinations of hardware, software, sensors, and control systems, GATES technology has defined industry standards in advanced food safety principles, production levels, and environmental stewardship values for greenhouse production.